with the corresponding clinical departments at the LUMC, including Orthopaedics and Rheumatology. 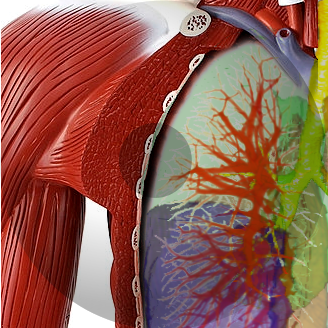 The pulmonary applications are focused on the quantification of lung diseases, such as pulmonary emphysema and interstitial lung disease, using CT densitometry and automatic detection and assessment of bronchial and vascular structures. The orthopaedic applications involve projects, in which the micro-motion and wear of endoprostheses are measured. Together with Rheumatology, our research is focused on quantifying cartilage in hand osteoarthritis and early rheumatoid arthritis in hand MRI. In collaboration with the department of Ophthalmology and the C.J. Gorter Center, MRI scans of the eye are processed to detect and quantify eye anatomy and pathology.